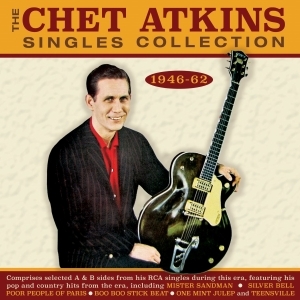 Chet Atkins was one of the most innovative and influential personalities in country music in the post-war decades, both as a highly skilled and distinctive finger-picking guitarist, and as a record producer and session musician, helping to shape the “Nashville” sound which helped broaden the popularity of country music in the late ‘50s. This great-value 59-track 2-CD collection focuses on his work as a recording artist, covering a period over more than a decade and a half during which he progressed from being a journeyman country musician to one of the most respected and imitated guitarists in all of popular music, not just country, with major rock artists later citing him as a key influence. Deriving his style from influences as diverse as Merle Travis and Django Reinhardt, he developed a finger-style technique which set him apart from his peers and gave his music and recordings an increasingly distinctive flavour. This anthology comprises selected A and B sides from the singles he released during the period covered by this collection, so that it provides a fascinating musical journey through the years when his stature within the business inexorably grew, and his work as a performer became overshadowed by his studio work with other artists, and his A&R role at RCA. It naturally offers plenty of examples of his unique skill as a guitarist but also shows the many sides of his talents as singer, bandleader and songwriter, and includes all the country chart entries he had during this time with “Mr. Sandman”, “Silver Bell”, “Jean’s Song”, “Boo Boo Stick Beat, “One Mint Julep” and “Jingle Bell Rock”.